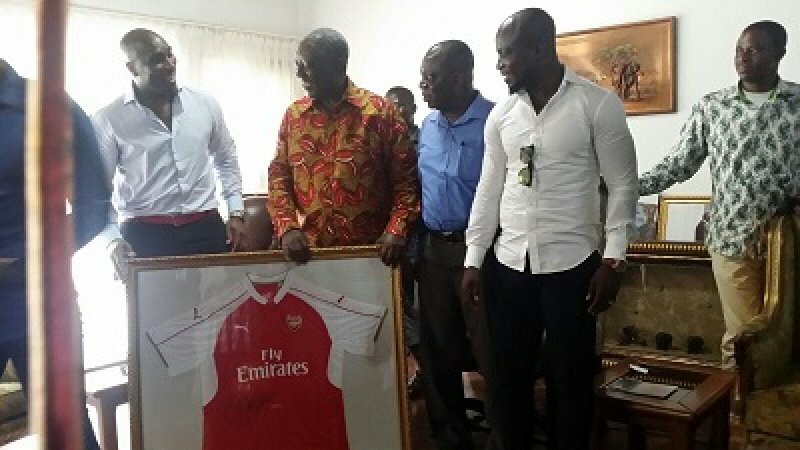 Former Arsenal and Tottenham Hotspurs defender Sol Campbell together with former Black Stars captain Stephen Appiah Monday paid a courtesy call on former President John Kufuor ahead of his 2016 Peace Cup. Campbell who is joined by former Middlesbrough captain George Boateng are in the country under the patronage of Primeval Media, who are organising two friendly matches, to preach peace ahead of the November polls. Campbell’s team, the World XI, which will be made up of players like Edgar Davids, Emile Heskey, Didier Drogba, Samuel Eto’o, Steve Mcmanaman, Patrick Kluivert and others will first play Asante Kotoko before they meet the Black Stars of Ghana in the second match. Campbell, Appiah and Boateng would be on the Morning Starr Tuesday with host Nii Arday Clegg.